Editor’s note: I’m excited to offer Forever 45’s readers a guest post from Rebecca Moore. Rebecca’s husband noticed that the Costco in their city advertised a women’s fashion event coinciding with New York Fashion Week, so she decided to check it out for us. Thanks, Rebecca! You can read more from Rebecca, fiction and nonfiction, at The Wertis and Lunch In Brooklyn. It was my husband who saw it first, digging around on the Costco website. Our local store would be holding a special event for Women’s Fashion Apparel. I know. I had the same thought. But I live in Huntsville, Alabama. We have a lot of things going for us here: an unnaturally high concentration of Ph.D.s, beautiful hills and trails, the first H&M in the state (take that, Birmingham) and one of two Apple stores in the state, but we are not a fashionable place. Before moving to Huntsville, I lived in New York City and London. I am not a hair and make-up person. I endure high heels in rare and brief bouts of vanity. They really are excruciating. Wedges and platforms I like, but you can’t drive in platforms. I am a disheveled middle-aged quasi-hipster living in a place that doesn’t do visual irony. Last year, I complimented someone on her skirt and it turned out that she had made it at a skirt party. I felt completely out of my depth. It was a great skirt. I wish I could sew or had a seamstress. I wish knew about more stuff. I wish I were the kind of person who could go to a party and, amid glasses of wine and chit-chat, decide a fabric and style that would suit me that well. It makes you realize the importance of dresses in 19th-century novels, of having an eye for color and design, of selecting well, a skill many of us have lost in these days of cheap, mass market clothing, where you won’t be skulking through the season in something unflattering that will diminish all prospects of making a good match. Instead, I can make dozens of small, fairly inconsequential mistakes. Or spend an hour looking at the Boden website and not buy anything. What could a fashion event at Costco possibly entail? Was it a rumor that got started when someone gave a definition of oxymoron? If you look on their website, clothing isn’t even a category they mention. Back in high school in NYC in the early ’80s I would travel 14th Street to get to school. This was before Zeckendorff Towers, before the heroin dealers were pushed out of Union Square by the Farmer’s Market. The smart shopper could find funky, ’60s style, possibly even actual stock from the ’60s, enameled earrings for $1 a pair. And I found opaque black tights, which were not the fashion staple then that they have been these last 30 years. Yes, 14th Street was the place to buy velvet paintings of Elvis or panthers at sunset and sofa throws depicting the Last Supper, but surely, between Wig World and all the children’s zapatos, there would be some finds. I wanted something nobody else had. This was why my friends and I loved thrift shops; what we found was ours alone. Any fool could follow trends. And it is exactly this 15-year-old’s attitude that rises when I hear about Costco’s fashion event. It’s not about buying bulk, or buying cheap, in this instance: it’s about outfoxing the others. Yeah, everyone goes to Costco, but do they know how to shop? If Costco had a fashion show they could serve little sample glasses of Kirkland cava and paper cups with gravlax on La Brea pumpernickel and one tortilla chip with salsa on it. They could illuminate the runway with the purple LED trees and the Christmas lights that have just made their Labor Day appearance. But, when I get there, no one at the store knows anything about it. The woman running customer service looks at the store’s calendar bookings. A children’s legging salesperson will be there one day and there is an underwear rep coming another. 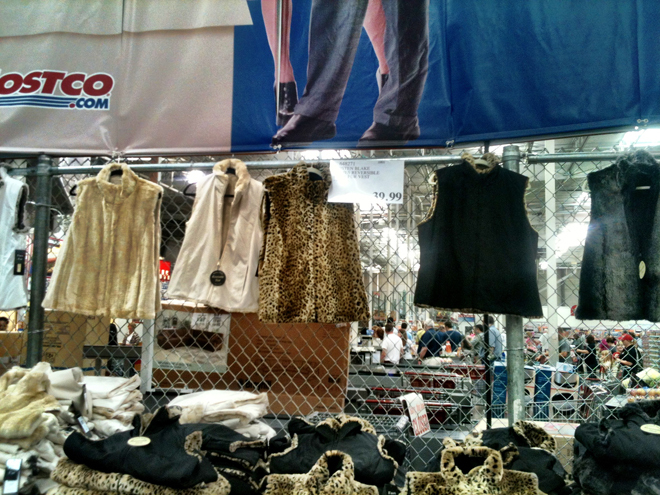 The faux fur vests featured in the Costco Connections magazine are hanging at the front of the store. I think that is as fashiony as it’s going to get around here. I stalk through the pallets of Kenneth Cole plus size black bootleg trousers and the boysenberry, mint and white fleeces and wonder, were I to be challenged to shop for clothes here, what I would buy. Levis, I think, and a white men’s undershirt or a layering tank with a built in bra and one of those big sherpa blankets you could keep in the trunk in case of emergencies could be a kind of wrap. It would be a failure of imagination. A fashion student might head for the paper and make some intricate and fragile costume out of yellow legal pad paper. Or maybe I would break down and buy the fur vest. There are some printed tops with a sort-of 60s/Ikat design on them. Maybe those. I glance desperately at the children’s clothes. There are some tutus that could be refashioned into a floor-length skirt and sewn onto the modal Ikat shirts to make a kind of Rodarte dress to wear with some olive green Wellington boots. If I were another person entirely. The vests are reversible. There is something here that threatens to suffocate any creative spirit. Once at a baggage carousel, an older woman described her luggage as being “Costco black” and I knew exactly what she meant: functional and hideous. Here, black clothes are an unfashionable shade of black. I would buy a fake fur coat, but not a reversible, no doubt weatherproof, vest. Whatever women’s fashion apparel means at Costco HQ, it seems to be a mirage. But Costco Fashion Week should mean something more than a snide joke, it should be a challenge to all of us to look for the unusual and the overlooked, as well as a reminder to be realistic about where we are looking. But, I know, you’re thinking that the vest on the left might actually work. And it’s only $39.99. ← Fall Transitional Wardrobes: Transitions Can Be Fun!